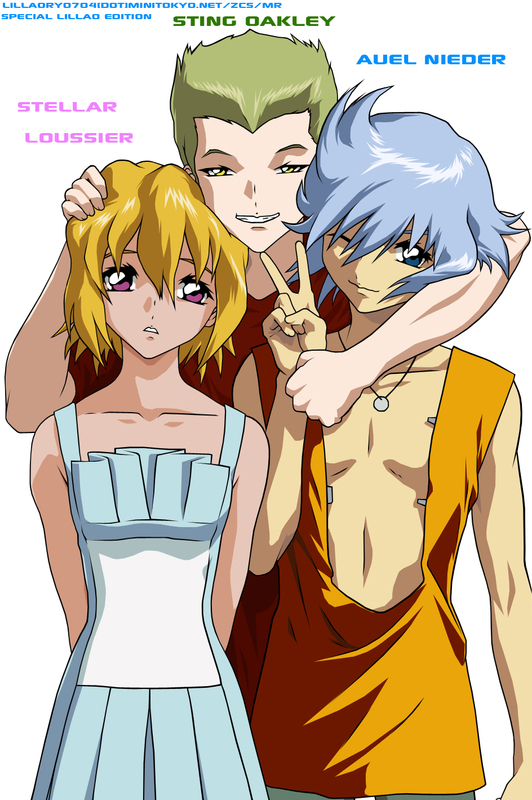 This is a vector that took me 2 days, its stellar, sting, and auel, i did the outlining for stellar one day, then sting and auel's outline, then i did each of them in order, stellar, auel, then sting last, since he's behind them, and i colored them in order too, i used other scans of them to have their colors on their clothes, skin, hair, ect., and its all finished up, this is a the second special lillao edition, meaning i did something that i usually don't do on my vectors, and there are some of you that know what it is, these 3 are my favorite, second to the 1st omni children :P , well hope you like it, Ja! Please Full View, Thumbnail Looks Ugly, Ja! wow such a wonderful Vector! I absolutely Love it! Very clean, clear, & smooth vector. Altough the colors are too bold^.^'; I officially hate them all. Espcially Stellaar. She's a CHEATER! The lines are very nice too. Awsome job! I'll definately add this to my favs! Keep up the awsome work! Very nice one.Thanks a lot. the whole picture is really great and the title fits them perfectly^^ great job! OMG! This is a great vector. The characters are real cute and all. The colors are done perfectly and the outlining is great. Keep up the good work.